The Fairmont Orchid, Hawaii is a luxury resort located on the sunny Kohala Coast of the Big Island with a beautiful 10,000-square-foot swimming pool, a great spa, many restaurants and an array of activities for the whole family. Relax at the health spa, play 36 holes of championship golf, snorkel just off the shore, sign up for a tennis lesson and soak in lava-enhanced whirlpools. The Beach Club is a lively spot where vacationers come to enjoy the sun, observe colorful marine life and play in the water. Activities such as kayaking, paddling, swimming and snorkeling to guests. Sign up for the Activity Package which includes equipment rental as well as water aerobics, seaside yoga and other fitness programs. The Tennis Pavilion has 10 plexiplave courts and a stadium court with bleachers. Private and semi-private lessons are available to resort guests. The hotel knows what a family needs while on vacation: a white-sand shore, a choice of activities, restaurants and a children's program. We liked the kid's pool with a sandy bottom near the main pool - your little ones will splash around for hours and meet new friends. The hotel bay is protected so that kids can play in sandy shallow water. When we were staying at the resort, kids really enjoyed the conch blower and the tiki lighting ceremony at sundown each day. A children's program for ages 5-12, Keiki Aloha Adventure is a full or a half-day program with diverse daily activities such as Petroglyph hikes, shell hunting, tide pools and Koi feeding. The cost is $85 for hotel guests and $95 non-hotel guests. The fee includes snacks, lunch, beverages, a t-shirt and special gifts. Half-day programs are $65 for hotel guests and night programs are $50. The swimming pool is located in the heart of the resort, near the ocean. Open 24 hours a day, the 10,000-square-foot swimming pool is surrounded by tropical plants. There are two outdoor whirlpools, table tennis and the outdoor spa treatment huts on top of the hill behind the pool. During the day, guests can participate in water aerobics and other water fitness classes. For lunch, have a casual meal at the Brown's which overlooks the Pacific Ocean, or get a box lunch from Brown's Deli. Snorkel just off the shore and spot turtles feeding on plants on the sea floor. Sometimes the turtles crawl onto the sand, claiming a sandy patch of their own. Inside and outside the bay, snorkelers will discover different species of fish and coral. Snorkeling gear can be rented from the Orchid Beach boys, and if you've signed up for the optional Activity Package, equipment rental is included. In the evening, watch the free hula show at the nearby open-air mall. 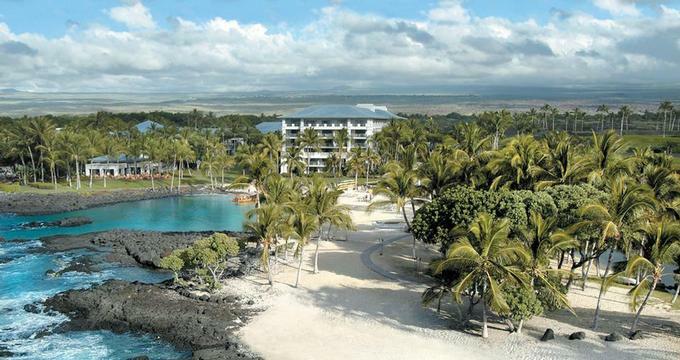 Pauoa Beach which fronts the hotel is surrounded by lava rocks which provide a natural habitat for tropical fish, green sea turtles and coral. Guests can rent private cabanas which come with coolers filled with fruit and bottled water. If you don't want a cabana for the day, lounge chairs and towels are provided to guests. The Orchid Beachboys, stationed in a thatch-roofed building, serve drinks, hand out towels and rent equipment. Choose from a variety of activities, including kayaking, canoeing and surfing. The Spa Without Walls is a full-service health spa that offers a wide variety of treatments. As its name implies, the spa offers treatments in several outdoor locations which allows you to enjoy breezes and sounds of the water while receiving your rejuvenating treatment. We especially like the treatment room above the waterfall where you can receive a massage while looking down at the water through the opening in the massage table. Play 36 scenic holes of golf around black lava rocks, ponds and ocean views. The course is divided into two separate 18-hole courses. The South Course is a Par 72 course built on a rugged lava flow with ocean and mountain views. The North Course, also a Par 72, is built on older & smoother lava flow. The Fairmont Orchid, Hawaii has several restaurants and bars. Brown's Beach House serves innovative, island-inspired 'East Meets West' cuisine. For a romantic night out, book a table at the elegant Grill which serves contemporary, innovative style dishes. Begin the day with a breakfast buffet at the Orchid Court which offers several food stations serving everything from made-to-order omelets and meats to tropical fruit salads and Japanese breakfast. Be sure to taste the banana bread which is delicious. Brown's Beach House is right on the beach. Open for lunch and dinner, it serves dishes prepared using local ingredients. If you are in a hurry to get started in the morning, visit Brown's Deli next to the pool and pick up made-to-order sandwiches, fresh fruit to go, and snacks. The resort's fine dining restaurant the Grill features a fine-dining menu created by Executive Chef James Babian and Chef de Cuisine Tony Woodrow. Don't forget to admire the Koa-paneled walls in the restaurant. Norio's Sushi Bar & Restaurant has a sushi bar, a private dining room overlooking a koi pond, and tables for 60. For those who prefer to dine in the privacy of their room, the room service menu has a choice of appetizers, entrees and deserts, including dishes from Norio's. The Orchid Court is available for casual and family meals while The Paniolo Lounge and Polo Bar offer live entertainment and dancing on Friday and Saturday evenings. The resort has 540 rooms and suites, all with a private lanai. For a spectacular view of the ocean, book one of the Deluxe Ocean Front Rooms on your family beach vacation. The property couples several beautiful event venues. Whether you want to get married in a grand ballroom or outdoors, the planners at the hotel can help you arrange your dream day. The resort offers a number of packages. For example, the Orchid Romance Wedding Package includes all the essential detail such as marriage license arrangements, officiate for the ceremony, bridal hand-tied bouquet or lei, cake, Orchid certificate and more. Rates start from $1,559. There is also a vow renewal package, ocean ceremony package with torches and a Hawaiian musician. If you want all of your details taken care, including two night's accommodations in the Presidential Suite, limo transfers, photographer, oceanside massage, and more, ask about the Orchid Exclusive Romance event starting at $18,975. You'll have a choice of a private home ceremony, private yacht or a private oceanside estate. The hotel also offers a Platinum Honeymoon Program coordinated with the Platinum Concierge. From dining under the stars to fiery tiki torches along the ocean at night, the resort is a beautiful destination for couples. A visit to the resort's unique wellness center is a must. Treatment hales are situated in a quiet tropical area above the waterfall. Once of the houses has two massage tables for side-by-side massages. Snorkeling, green sea turtle watching and relaxing in a private cabana are some other activities you should not miss. Guest rooms are spacious and come with a private balcony overlooking the ocean, the golf course or the inner courtyard of the hotel. Ask about specials when booking your room. Book early and save 20% off the "Best Available" rate at the beautiful Fairmont Orchid. This package is available year-round, subject to availability and with the exception of the holiday period between December 21st and January 2nd. Full prepayment is due at the time of booking and is non-refundable in the event of cancellation. Fairmont Savers Package cannot be combined with any other offers or promotions. Bed and Breakfast package pricing starts from $369 USD per night, including one night room accommodation and breakfast buffet. You can often find deals, family packages and spa deals. At Kona International Airport you can rent a car or arrange for a car transfer to the resort (cab fare is about $100 one way).